With a big 1-inch, 20.2-megapixel CMOS sensor and a bright f/1.8 lens, the pocket-sized Sony RX100 is the hottest point-and-shoot camera on the market right now. Correction – it’s one of the hottest cameras, period. I borrowed one from my friend Adam Lisonbee, a.k.a., Grizzly Adam, so I could shoot some studio tests and get a feel for it. All I’ve done so far is shoot the studio sample photos below, so I don’t have much to say other than I love the specs, the size and the lens. And as expected, the 1-inch sensor delivers the goods. The image quality is excellent – the best I’ve seen from any compact camera, except the Canon G1 X, which has an even bigger 14-megapixe 1.5-inch sensor. But the G1 X doesn’t fit in your pocket – not even close. 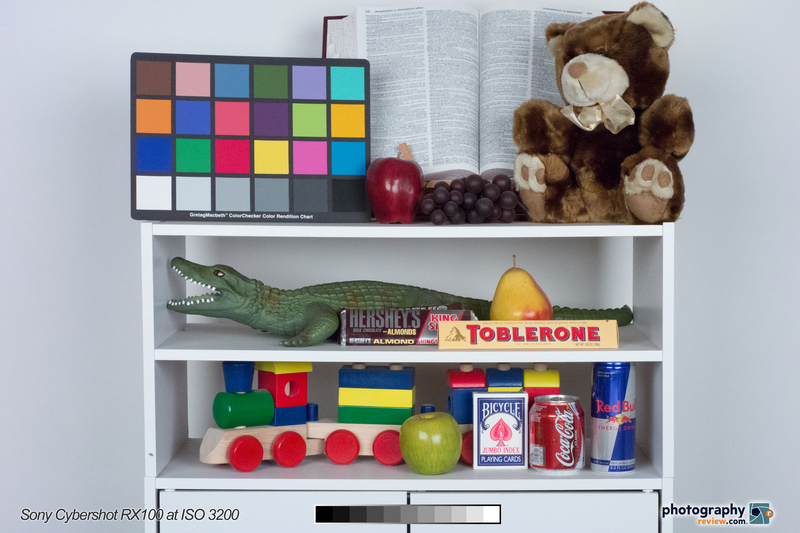 And the RX100’s increased resolution might make the image quality difference a wash, anyway. The Sony RX100 studio samples below were shot RAW in aperture priority at f/8 with white balance set on the tungsten preset. The RAW files were converted to 16-bit TIFFs with the Lightroom 4.2 release candidate software. The text, logo and graybar were added in Photoshop and the images were then resaved as maximum quality JPEGs. No sharpening, noise reduction or any other kind of adjustment has been applied. Please download, compare, print or anything else you need to do to fully evaluate the image quality. And stay tuned for a first impressions article after I get a chance to actually take some pictures with the RX100. For more information on the Sony Cybershot RX100, please read our announcement article linked below. And if you own the RX100, please write a user review! I’m very pleased with this p/s. F1.8 depth of field is dangerous so I usually set it to 2.0-2.8. ISO >=400 reveals too much grain. In normal lighting condition it works great but I wouldn’t push it beyond these limits.